Little, Brown and Company, 9780316265416, 352pp. All hell breaks loose in the liberal bubble when a mother's life spirals out of control when she's forced to rethink her bleeding heart ideals. For Karen Kipple, it isn't enough that she works full-time in the non-profit sector for an organization that helps children from disadvantaged homes. She's also determined to live her personal life in accordance with her ideals. This means sending her daughter, Ruby, to an integrated public school in their Brooklyn neighborhood. But when a troubled student from a nearby housing project begins bullying children in Ruby's class, the distant social and economic issues Karen has always claimed to care about so passionately begin to feel uncomfortably close to home. A daring, discussable satire about gentrification and liberal hypocrisy, CLASS is also a smartly written story that reveals how life as we live it--not as we like to imagine it--often unfolds in gray areas. Lucinda Rosenfeld is the author of the novels The Pretty One, What She Saw..., Why She Went Home, and I'm So Happy For You. Her fiction and essays have appeared in the New York Times, The New Yorker, Slate, the Wall Street Journal, oprah.com, and other publications. She lives in Brooklyn, New York, with her husband and two daughters. 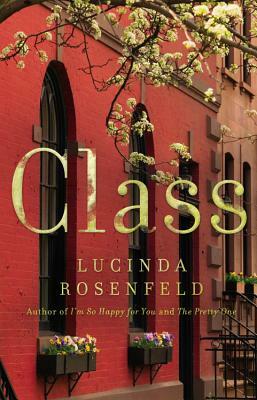 "Lucinda Rosenfeld's deliciously smart and original new novel, CLASS, had me riveted from page one. Karen Kipple's ethical dilemmas will be familiar to any urbanite with a conscience. Rosenfeld has pulled off something rare-she has shown it's possible to write a fun and juicy-yet also sincere-book about liberal guilt and social hypocrisy. "—Adelle Waldman, author of The Love Affairs of Nathaniel P.
"Every time Karen Kipple...worries about keeping her daughter in a New York City public school, I want to shake her - and look in the mirror."